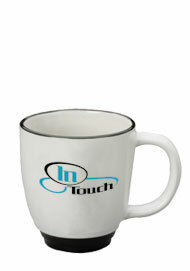 14 oz Halo Bistro White Body Mugs. At SalinaGlass.com we strive to leave more money in your pocket this holiday season by offering you cheap, factory direct pricing. Are you hosting Christmas this year or do you have to shop for that impossible person? 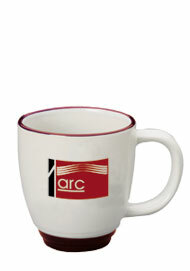 Why not use these elegant Bistro mugs as customized mugs and have them printed with a holiday motif? 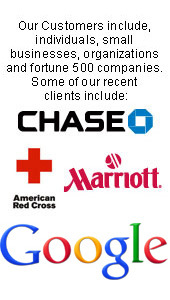 It is a great way to promote any event or business. 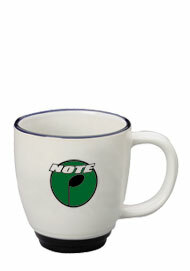 The ceramic mug is white with an accent halo and base which is available in six vibrant colors. 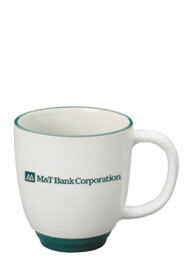 All of our printed coffee cups can also be bought as blank cups (unprinted).